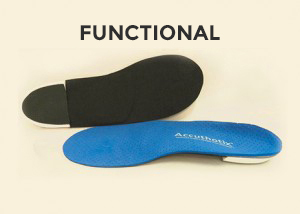 There exists a fair amount of confusion and controversy regarding which casting technique is best when prescribing custom foot orthotics and which materials used in the fabrication process is best. Of course to answer that one must understand the difference between an “accommodative” orthotic device and a “Functional” orthotic device. If our goal is to merely decrease shear forces under the foot and re- distribute the body’s weight more evenly throughout the foot surface, then we would use softer materials. In other words, we are not controlling the abnormal biomechanics and motion of the foot, but merely making the patient more comfortable. This type of device is used primarily for the diabetic patient and/or the senior patient who has a severely rigid deformity. In contrast, if our goal for the patient is to control the abnormal biomechanics of the foot when a patient is over- pronating or supinating, then we must use materials that allow the foot to move appropriately during all phases of gait and at the same time prevent the foot from going into its abnormal compensated and pathological positions. As a general rule, the more rigid the deformity of the patient’s foot, the softer or more accommodative the orthotic device can be. 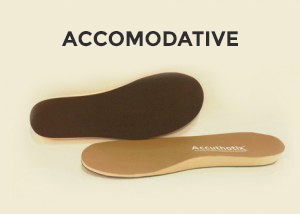 If the patient has a flexible deformity, the more rigid the orthotic device can be.